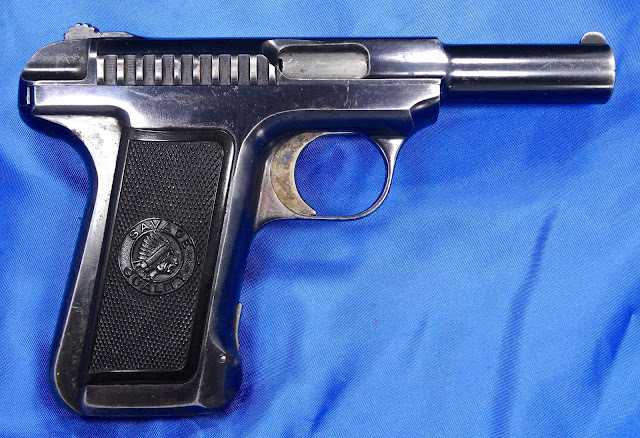 The Model 1907 in .32 ACP was Savage's entry into the pocket pistol market. The pistol was derived from their entry into the 1907 military trials to find the United State's first self loading, semi-automatic pistol in .45 caliber. Savage produced 650 45 ACP pistols for the trials which the military returned after the trials were completed and the Colt entry was chosen. Savage then sold them on the commercial market and if you can find one today you'll have a very valuable pistol. Good luck finding one! Savage felt that a scaled down pocket pistol would be a better seller than a large bore handgun so the .45 ACP model never made it into Savage's consumer catalogue. 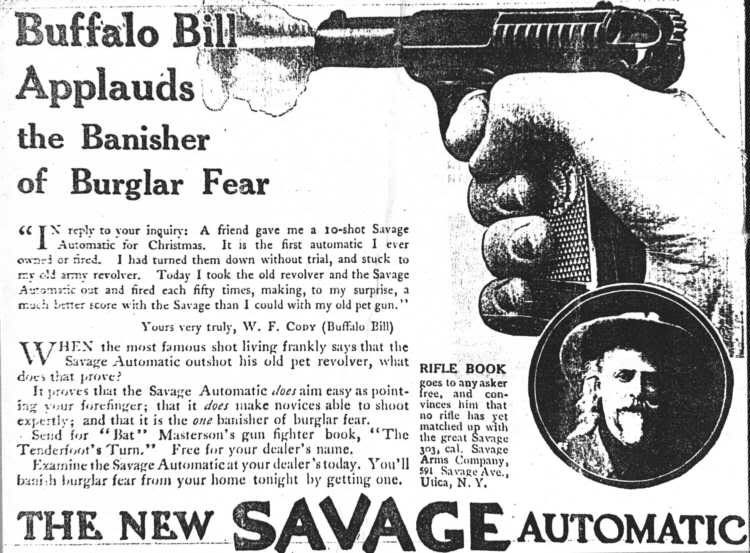 One wonders how the .45 Savage would have been received if it was put into wide distribution, but one does not need to wonder how the 1907 .32 fared. 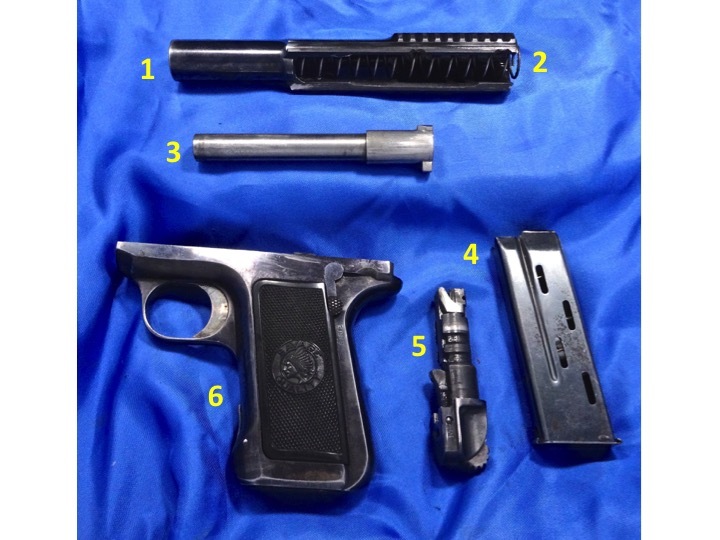 It was a hit and Savage ultimately produced 235,000 model 1907 pistols. The pistol had many interesting and unique features. 1. The circular knurled knob at the top is not a hammer as the model 1907 is a striker-fired pistol. 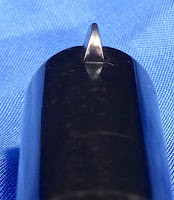 The knurled knob is actually a cocking indicator. 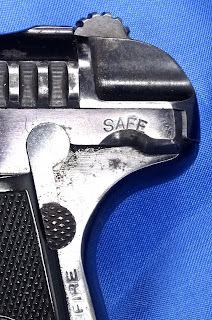 As pictured above the knob indicates that the pistol is not cocked. If it was in the rearward position then the striker is cocked. 2. 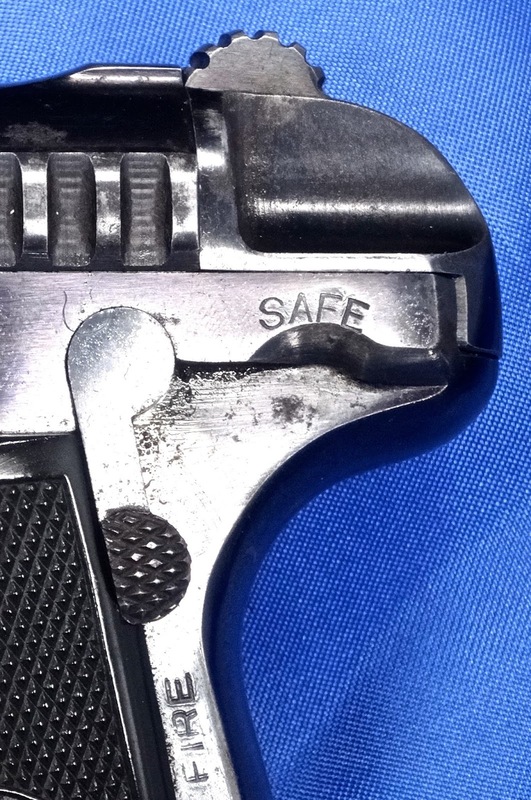 The slide rides inside the frame, as do the modern CZ pistols, rather than riding on top or outside of the frame. 3. As the slide rides inside the frame, little of the slide is left to grasp in order to rack the slide and charge the pistol. To help that function Savage put large and well spaced cocking serrations on the slide to assist with its manipulation. 4. The magazine holds 10 rounds in a double stack configuration. I'll bet you didn't realize that double stack magazine go all the way back to the early days of the last century. 5. 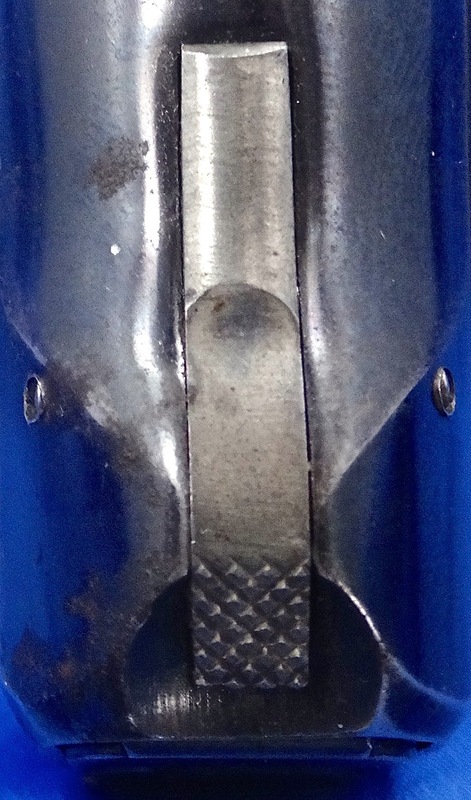 The magazine release sits at the bottom of the front strap. One is supposed to be able to operate the release using your little finger. This is a skill I have yet to acquire. 7. 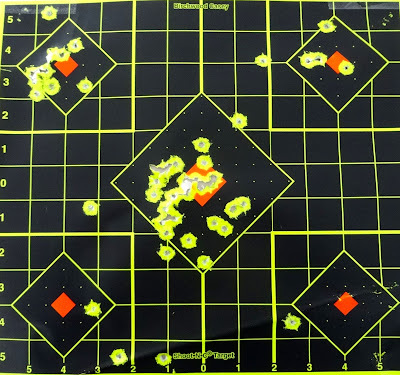 The sights are small and representative of an era where shooting was done quickly without taking the time to obtain an ultra precise sight picture. The key to field stripping this pistol rests with the fire control mechanism. You begin by removing the magazine and retracting the slide to its furthest rearward position. You then engage the safety to lock the slide back. Then grasp the rear of the fire control mechanism (part #5 above) and twist it 90 degrees clockwise. At that point you pull the mechanism out and the rest of the pistol can be pushed forward and off of the frame. The Savage 1907 has a great Art Nouveau appearance and I love the look of the checkered grips with Savage logo on them. Shooting the 1907 was very pleasant. 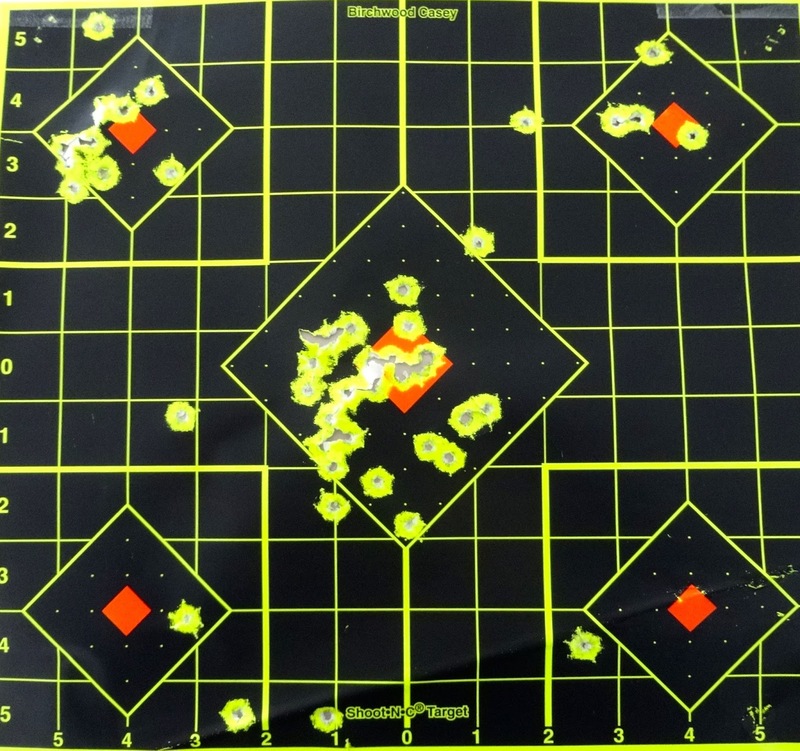 The .32 ACP has a modicum of recoil but before we get to the targets I would remind you that the sights are minuscule at best and the pistol is over 100 years old. The target above was shot with Remington FMJ ammo at 21 feet. 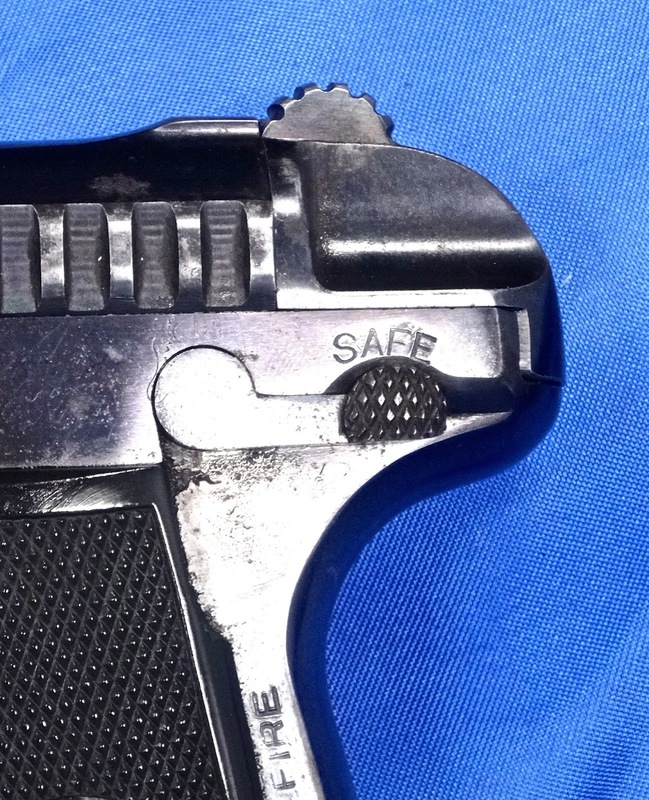 This is a pocket pistol designed for close quarter engagements hence, I did not fire it beyond the 7 yard marker. 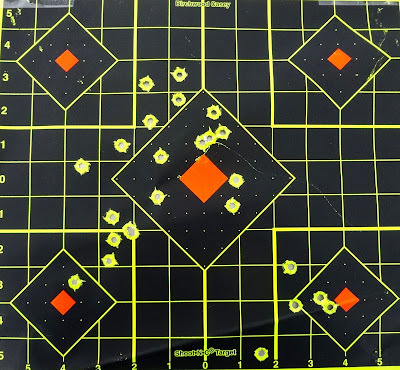 I would note that I only shot at the middle and top two diamonds. The rounds in the southern hemisphere were shot at the equatorial target. Still, for what this pistol is designed for, it would serve is purpose well. This target was shot with defensive hollow-point ammunition. PMC JHP ammo was used in shooting at the center section. Of the two magazines of ammo used, there was one double feed with each magazine. The bottom righthand diamond was shot at with Hornaday JHP cartridges. 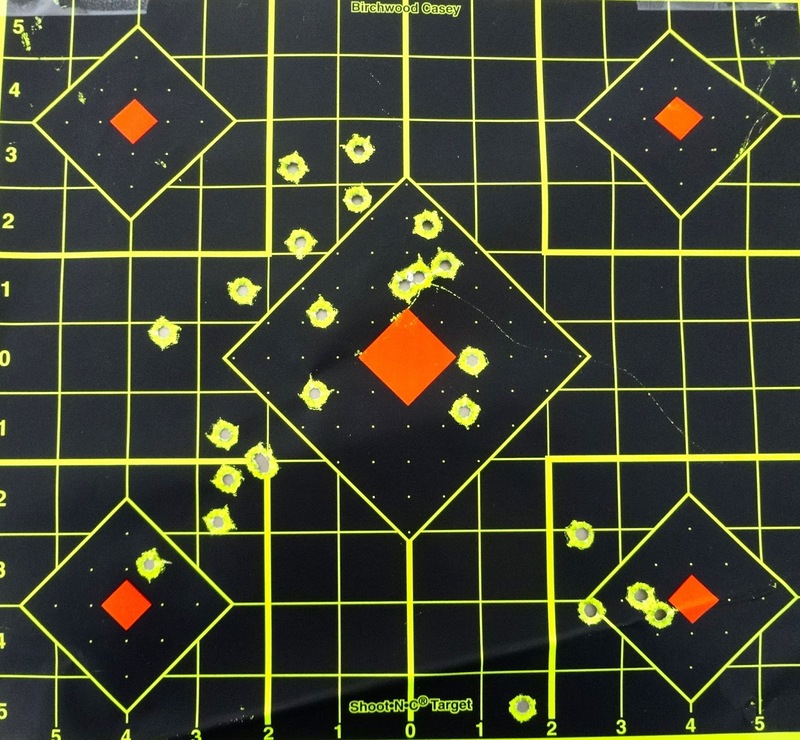 They were a tad more accurate than the PMC and I had no reliability issues although I did not load and shoot a full magazine of the Hornaday fodder. 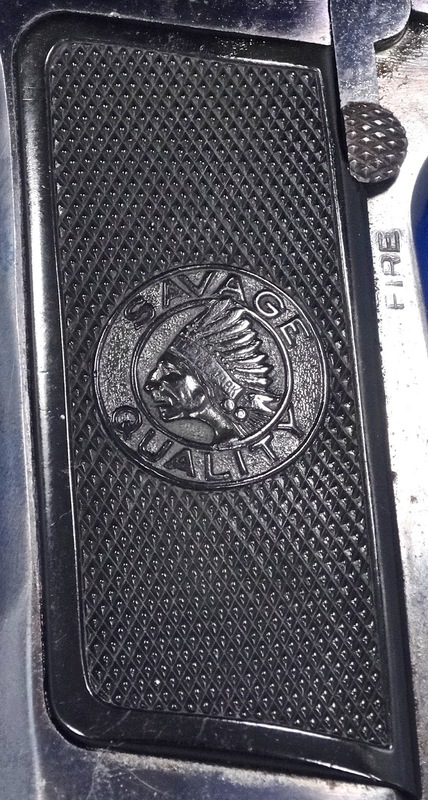 Another interesting facet surrounding this pistol is how Savage chose to market it. They made a major play toward the women's market. This is a segment that is still somewhat underserved today but Savage was playing on the fears present in the time period of 1910 - 1920. 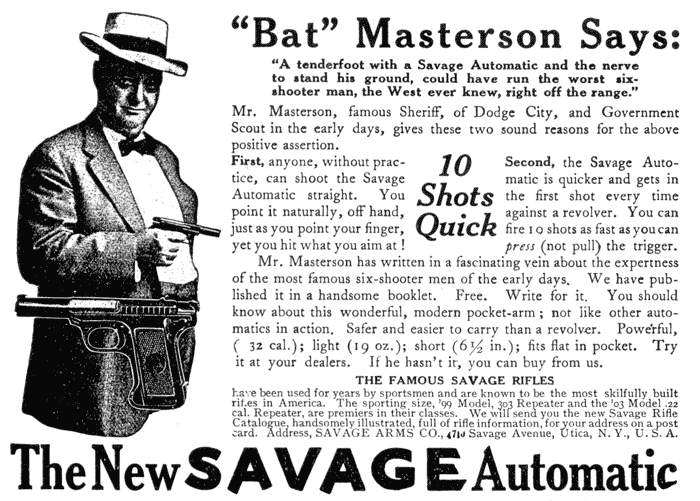 Above is one of the many ads that Savage used to market the pistol to the female market. This was the beginning of the highly industrialized era in American history. In urban areas the women's husbands and fathers were typically working 12 hour shifts at a factory so they were not home much of the time. 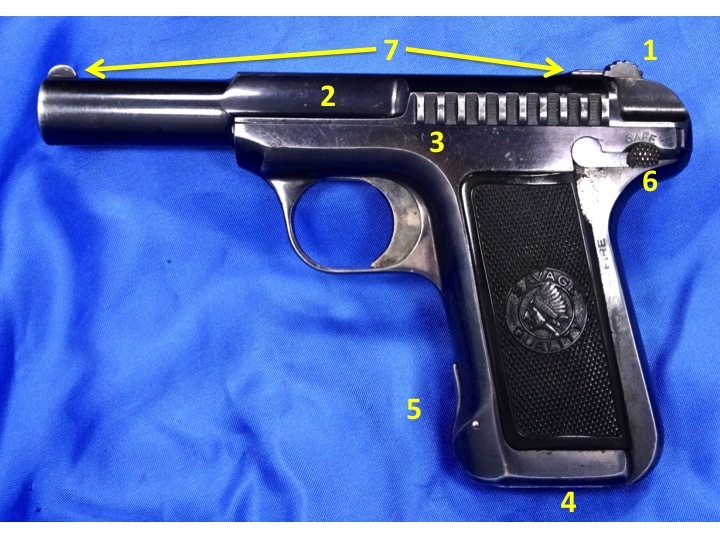 Fear of burglaries and other criminal intrusions were used to sell this pistol. The ad features the 1907's slogan "10 Shots Quick" and states that the pistol "Aims Easy as Pointing Your Finger" while asking "Are your little ones and property safe?" The fear of threats towards your children is a powerful motivator. Savage also used celebrity endorsements to great advantage. Former buffalo scout and legendary Western lawman "Bat" Masterson also endorsed the pistol with the ad repeating the "10 Shots Quick" slogan. I think the Savage Model 1907 is an important historical pistol for it's innovative design and unique marketing program. It was aimed at an urban market, targeted toward women, and utilized legends of the Western frontier to provide endorsements. It also served to transition those who carried handguns away from their revolvers toward the self-charging, semi-automatic pistol.